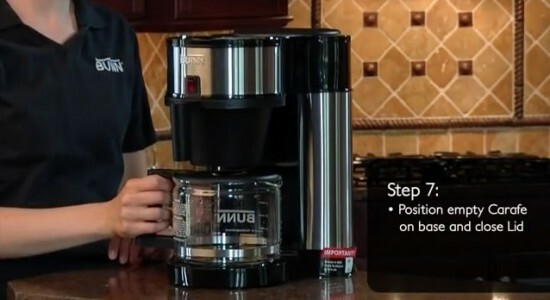 The Bunn Velocity Brew line of coffee makers are exceedingly simple to operate, and they are also simple to set up. One very important thing to remember, though, is that YOU MUST NOT PLUG IN YOUR BUNN VELOCITY BREW BEFORE COMPLETING THE SET UP PROCESS. Bunn’s instruction manual actually says that you can plug it in after Step 5 (filling the reservoir with water for the second time) but I would recommend following the instructions below and plug it in after all other steps have been completed. Follow the Velocity Brew setup instructions carefully, don’t plug it in prematurely (insert tasteless joke here), and you should be all set. Really, all you’re doing here is filling the machine with water and then plugging it in when you’re done. 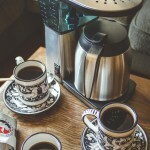 If you don’t own a Bunn Velocity Brew coffee maker yet, you can read my review of the Bunn BXB Velocity Brew or head over to Amazon.com and buy one today . 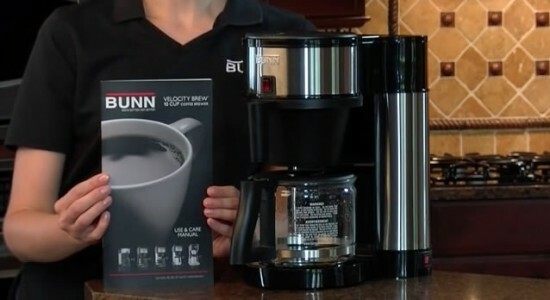 This Bunn setup guide is for the Velocity Brew line of coffee makers. 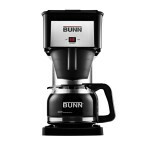 If your Bunn coffee maker doesn’t look like one of these, you should consult your instruction manual for setup instructions. 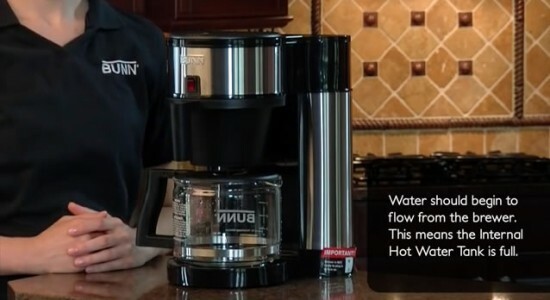 The Bunn Velocity Brew line of coffee makers is equipped with a heated water reservoir which is always ready to serve a pot of hot coffee in about three minutes (unless you’ve flipped the vacation switch to turn off the water heater). But you knew that already. Bunn is very serious about not plugging in the Velocity Brew coffee maker before setup. Doing so will result in permanent damage to your coffee maker and void the warranty, leaving you with a big shiny paper weight. My guess is that the heating element will be damaged if it is turned on too soon. 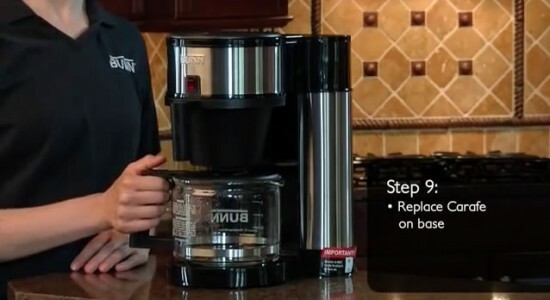 Ok, let’s get on with the Bunn Velocity Brew setup instructions! 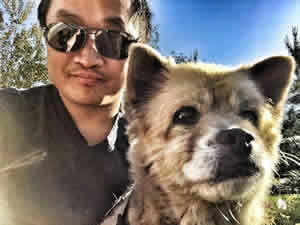 Don’t be intimidated by all the pictures; It’s really very easy. Step 1: Slide the empty Brew Funnel into the funnel guides the same way you would if you were going to make a pot of coffee. No, you don’t need to put in a coffee filter. You’re just filling the Bunn Velocity Brew with water here. Step 2: Fill the Bunn Velocity Brew carafe with cold water. 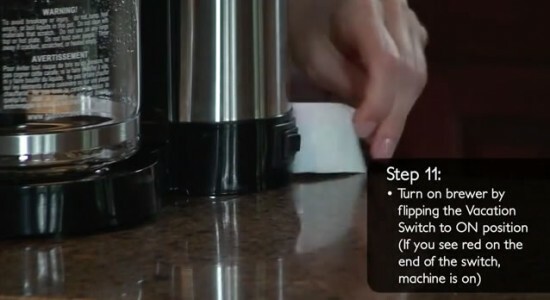 Step 3: Open the lid on the top of the machine and pour the water in. 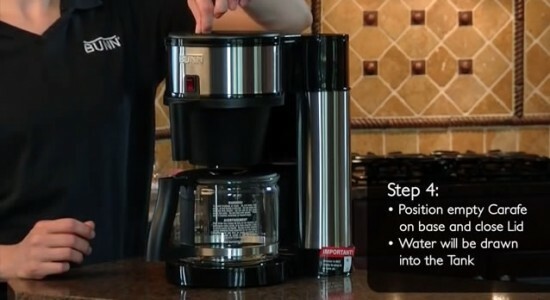 Depending on your Velocity Brewer model, your lid will either flip up or slide open to the side as pictured here. Step 4: Place the empty carafe on the base and close the lid. Wait three minutes while the water you just poured in is drawn into the tank. Step 5: Remove the carafe from the base and fill it with cold water again. 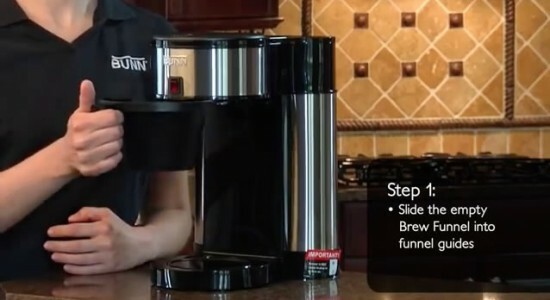 Step 6: Pour the water into the brewer. Step 7: Put the carafe back on the base and close the lid again. 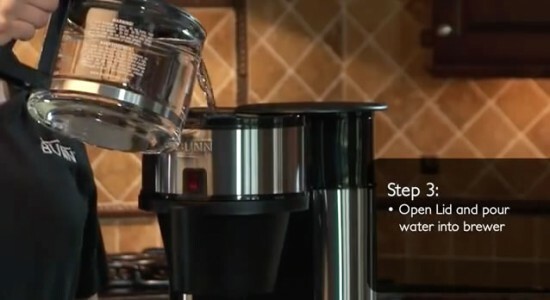 Water should begin to flow out of the brewer and into the carafe. When this happens, the tank is full! Step 8: Discard the water in the carafe. Water your plants with it or something. Step 9: Put the carafe back on the base. 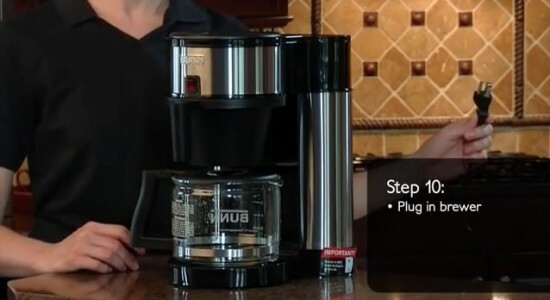 Step 10: Ok, NOW you can plug in your Bunn coffee maker. Step 11: Peel off the warning label covering the Vacation Switch and turn it on. If it’s on, red will be visible. Now you need to allow the water tank to heat up. This takes about 15 minutes. Congratulations! 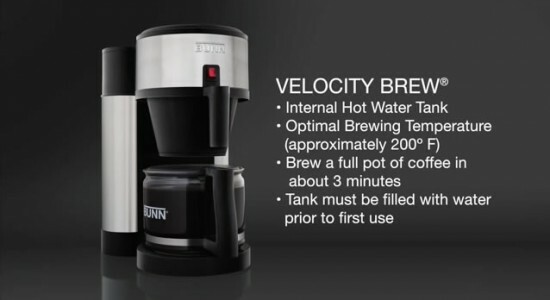 Your Velocity Brew is now ready to start brewing coffee. If you need more help, check out the instruction manual or give Bunn a call. I hear their customer service is very good. You’ve reached the end of this tutorial. 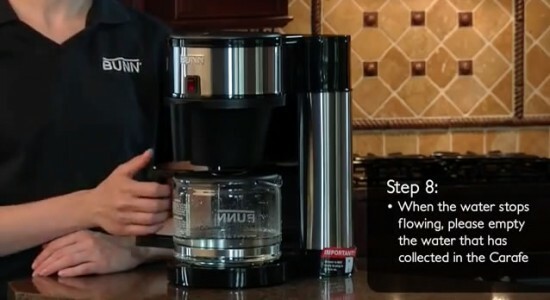 If you don’t already own a Bunn Velocity Brew machine, you can check out a review of the Bunn BXB model or go order one for yourself right now . I don’t understand how to brew only a half pot of coffee if you have a full reservoir of water. And if you’re leaving the pot on and keeping the water at 200 degrees, doesn’t some of that water evaporate between uses? I don’t understand this. Hi Laurie, thanks for commenting. When you use the Velocity Brew, you pour cold water into the reservoir which displaces the same amount of (already hot) water into your coffee pot. 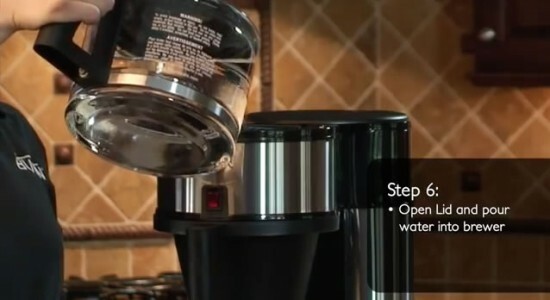 Just pour half a pot’s worth of cold water into the reservoir and a half pot will be displaced and come out as coffee. As for evaporation, this is probably true if you are a very infrequent coffee drinker who leaves the coffee maker plugged in for days/weeks at a time without using it. 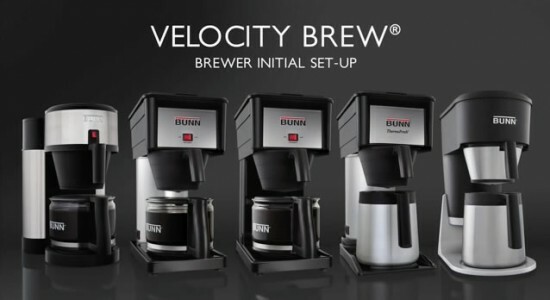 The Velocity Brew line is designed for frequent (i.e. : daily) coffee drinkers who don’t want to wait around for the water to heat up. I’m thinking of making this purchase for use in my home, and one of my biggest concerns is the energy being used by constantly keeping the water hot, and the fire hazard that may come with this. I wouldn’t want to buy this and see a raise in my power bill! Any idea about how much energy this is using? Thanks! Hi Jessica, thanks for commenting. If you’re very concerned about power consumption and fire hazard, then maybe you’d be better off with a different model. 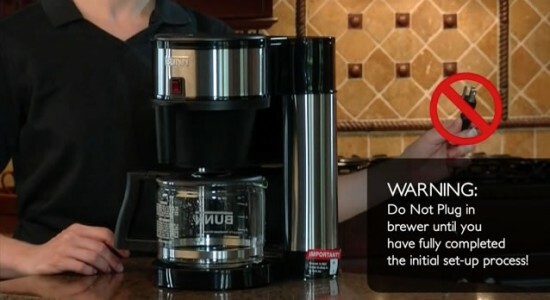 The Behmor Brazen Plus and Behmor Connected Brewer are both on sale right now, so maybe give those a look? They aren’t as fast as the Velocity Brews (no coffee makers are) but they’re solid and SCAA-certified. 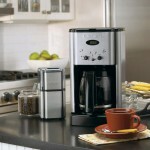 If a quick brew time is a major concern, most coffee makers are going to fall into the 5-7 minute range. 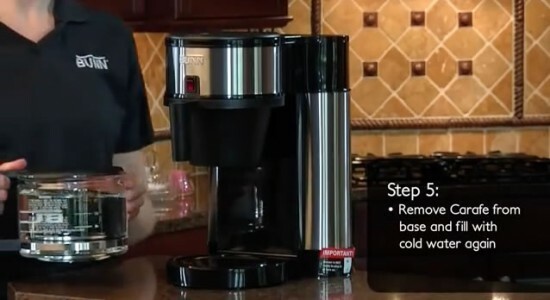 Any non-Velocity-Brew that brews faster isn’t heating the water properly. The Bonavita BV1900TS reportedly brews in about 6 minutes. Incidentally, it’s also on sale (about $130) and it’s also SCAA certified. Hope that helps!